Are you feeling worn-out from your daily routine in the house while looking after the kids? Does it bother you when you face the mirror and you don’t seem to recognize yourself anymore? While looks are certainly not everything, it’s been proven that those with a positive image of themselves tend to feel less stress, which in turn leads to more enjoyable parenting. Being a parent is never easy, but being a stay-at-home mom is much more challenging. We love our family so much that we give up a lot of things, and sometimes we may forget about ourselves – which should not be the case. We should not forget that we moms are important. Without a mom staying sane to keep the household going, there’ll be a huge difference to what a home could become. Why Is It Very Challenging To Become A Stay-At-Home Mom? Who said that you actually need to sit in front of a computer or wear a corporate attire to do multi-tasking? At home, you need to accomplish a lot of things in a snap of a finger – cooking, doing the laundry, bathing the kids, feeding the kids, keeping the kids safe, healthy and happy, doing the dishes, cleaning the house, and maintaining the cleanliness (which is a lot harder). Add to these errands for groceries and bill payments. You may also need to learn to become a nurse (to take care of the sick), a driver (to bring and fetch them from school), a referee (when kids get mad at each other), a teacher (to help them read and write), a counselor (to whom they could confide their feelings) and of course, a “genius” who can answer questions regarding anything and everything under the sun. So the question is, when can you have a bathroom break? Love your home because it is where you’ll always be. When you decide to become a stay-at-home mom, you may need to forget a couple of stuff you have enjoyed when you were still working or way back your pre-kid status. Though it is actually an advantage to be there whenever your little child needs you, there will also come a time that you might feel restricted and isolated from the outside world. 3. You’ll Be On Duty 24/7. Okay, so do you still know what a “day off” means? If you’re a stay-at-home mom, you’ve probably dropped that word out of your vocabulary. If you’re lucky, you may have the luxury of having even just an hour off from household and mommy duties. This is especially true if you are still raising younger kids who are almost totally dependent on you. You’ll be surprised at how you’ll treasure simple pleasurable moments like having a full bath or enjoying a coffee while it’s hot. As you can see, being a stay-at-home mom is a very challenging role, but don’t be discouraged. All those difficulties and stressful situations will eventually pay off. When you see your kids smile and offer you their warmest hugs and kisses, all the hard work and body aches fade away. However, as much as we love our family, we must also love ourselves. This one’s a top priority. Enough sleep helps improve your over-all functioning, gives you time to rest and will keep you looking good the next morning. As per CDC guidelines, an average adult (aged 18 to 60 years) needs at least seven hours of night sleep. Since you do not have a boss or deadline to meet, you will have to find your own time to get enough sleep. If you’re having a problem doing this due to mommy duties, then here’s the trick – send your kids to bed early. When they sleep early, you can also finish all your tasks early and enjoy the rest of the night for your “beauty rest”. When you want to look good from the outside, then you’d better start from the inside. One of the good things about being a stay-at-home mom is that you get to plan and prepare the meal for you and your family. Since you are the master of the kitchen, you can easily shift into healthier meals rich in vitamins and minerals that will also benefit you in the long run. Incorporate fruits and vegetables into your daily diet for that healthier glow on your skin. Cut-down on too much oil and sweets to keep your body fit and fab. Make it a habit to drink plenty of fluids to keep your body hydrated. Most stay-at-home moms would agree that with their fully packed daily activities, it becomes almost impossible to make up time for exercise. Though you may have an extra time, you might eventually feel too exhausted to work out. However, studies show that exercise can positively increase one’s mood. In an article published by the American Psychological Association entitled “The Exercise Effect”, a Boston University professor named Dr. Michael Otto emphasized that exercise can actually enhance one’s mood and effectively help relieve stress in a matter of five minutes. So, the next time you’re too overwhelmed with your everyday routine, why not spend a couple of minutes jogging or do some simple workout? There are lots of ideas you can get from the internet, television or your fellow parents on how to do quick and easy exercise routines without leaving your home. By doing so, you can enhance your overall mood as well as keep a fabulous and healthy body you’ve been dreaming of. It is a known fact that stress could really make a person look dull and older than her age. Sadly, being a mom is always accompanied by stressful situations and among them are people who might cross the line and judge your parenting style. This is especially true with new parents, as they get a lot of inputs from family members, in-laws, friends, neighbors and even strangers on how they should raise their child and deal with family matters. This shouldn’t be the case. No person or even research can pinpoint the best parenting style for your family. As much as every individual is unique, every family has its own distinct characteristics and needs to be met. As long as you are thinking about the welfare of your child and your family as a whole, then nobody can tell you what’s right or wrong. Yes, it is alright to listen to advices and tips from other people, but the only person you should be coinciding with is your partner. Communicate with your partner about the parenting style that you’d wish to implement for your family and stick with it. By doing so, you can decrease your overall stress levels and maintain a positive attitude towards raising your kids and running your household. When you were single, you may have a large network of friends whom you can talk to and hang out with every time you feel bored or lonely. Well, say goodbye to them because you may not be able to see them for years when you become a stay-at-home mom! Kidding aside, this is the reality. Though there are some who are lucky and get to see their friends or relatives often, most home-based moms may find it hard to even communicate with other people to share their every day struggles. Nonetheless, establishing a good support network is extremely important. You may have a few trusted friends, relatives or your siblings whom you can lean on when you are not feeling okay. You may also take advantage of joining online parenting forums where you can share your insights and learn more about effective parenting. Having a positive support group will help you keep yourself “sane” and have a more positive outlook towards your family life. If you feel good inside, you’re sure to have that beautiful positive aura as well. Moms who chose to stay at home to take care of their family are doing a difficult job every single day but this shouldn’t be a reason to prevent them from looking and feeling good about themselves. These tips would help you achieve the better version of you, without ruining your duties at home. So the next time you see yourself in the mirror, plan on starting these easy ways to keep you a fabulous mom. 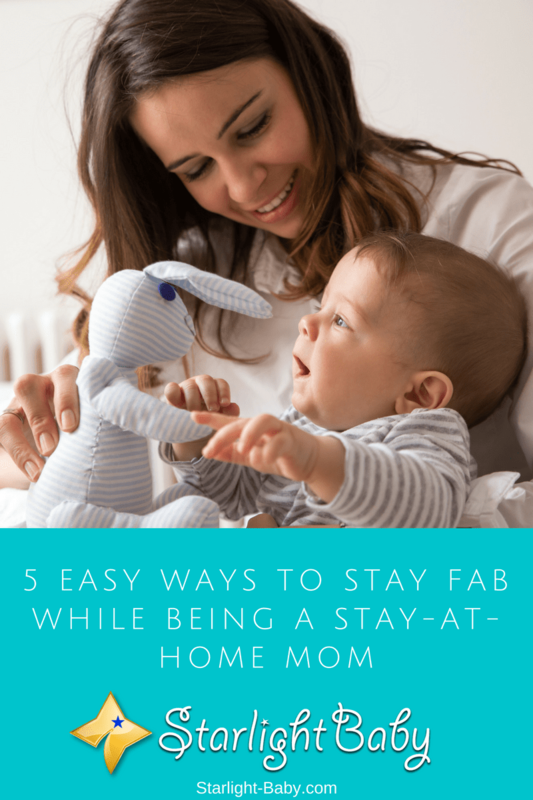 I could not agree with you more being a stay home mum is not easy.Especially when the kids are bit young it can be overwhelming ,the suggestion you’ve made are great. Exercises are good but at time mum don’t even have the time some times and looking for activities like walking are great and you can involve the kids as an activity and it can be refreshing. personally i joined Facebook groups for mom that are really helpful . Am glad some people understand the challenges and its also fulfilling that you get to raise your kid and everybody gets to get that opportunity.You have a very insightful blog and keep it up. I am stay at home dad. I mean I am a freelancer working from home. My wife goes to work, where as I sit in my home and work on my computer. When my wife is away for work, I have to look after the baby as well as work on ,my assignments. AS a person working from home who also has a baby, I can relate to most of these points. I will have to incorporate some of these tips. Yes, do make use of some of the tips because they apply to both stay-at-home mom and dad. We do hope you’ll find them really helpful as you stay home and care for your child. It is crystal clear that a mom cannot be a stay at home mom and find it easy, but I really understand the tips given and one of them that I found quite interesting is the exercising part for that is going to make it easier for the mom to handle some metal issues as well as being fit to carry out some home tasks. Also, sleeping is one act we shouldn’t overemphasize as well when we talk of stay at home moms. True, it’s not easy to be a stay-at-home mom. Working from home could sometimes make one feel it’s better to be working at an office because one only focuses on work as compared to being home where one’s attention gets divided into different tasks all the same time. I could not agree more on this. Beautifully written. Me and my wife are struggling for some time about taking care of our children and this article really helps a lot. From taking care of your children,to household chores, to taking care of yourself to be more fitted to the job as a parent. Wonderful article and really helpful! We’re really glad we are able to help you in our small ways. I totally agree! Also When we work outside the home, our time is extremely limited, and we find ourselves spending more than we need. As a stay or work at home mom, we are afforded more time than the working mother, so we are better able to take the time to save substantial amounts of money too. Omg Elsa,you hit the nail on the head. Very true what you just said there especially sticking to your own parenting style. I’m a new parent and it’s difficult coping with critics that think they’re the best at parenting. I can surely relate to that. I think all forms of parenting is great. The time put into rearing children pays off in the end, especially when you see those children grow into productive adults. I have had many opportunities to baby sit nieces and nephews. Baby sitting can be fun and reward especially for those who have a love for children. It is critical that mothers spend that quality time with their chidren, especially in those formative years. I have read the comments and suggestions and I think they are great. I totally agree with you, Midas721 — parents feel great pride to see their children grow up as responsible, caring adults. That is probably one of the greatest achievements for parents. And yes, quality time spent with the kids during their formative years contributes a lot to their personality. This is absolutely true to every word. I am a stay at home mom although I do work previously as a self employed engineer when I had my baby and it is nothing more tiring than being a mom, a wife and an all around moderator of your own home. It is quite tiring and draining at times but it is also rewarding. One thing I learned from being one is to always put yourself first. It may sound too selfish at first, but this is a reality that some stay at home parents often forget. When you take care of yourself first, you are energized to work all your duties without getting burned out by tiredness and responsibilities. When you have enough sleep, you can perform well. When you feel good about the way you look, you work happily. When you are healthy, you can finish everything you need to do. So it doesn’t hurt to take care of yourself first so that you can properly care for others. Always have that ‘me time’ everyday to reboot your mind and body before you retire the day. And also, start your day with that ‘me time’ too. Seizing the day ahead full of positivity and energy. Then I am definitely sure that you are one fab stay-at-home mom. It is a matter of time. People on today have more life facility than those who lived centuries ago. In this kind of process, the babies have gotten their own facilities while still in the mum’s belly. On the other hand, the parents have an accessive duty for the first two years of the baby, especially for mum. Yes, parents need to extensively care for baby during the first two years; I would say even longer than that. The child’s welfare should be an utmost concern, however, the parents, especially the mum should not also neglect herself while taking care of her baby. Being a parent, most specially those who stay at home to look for their offspring/s is not easy. So I would like to suggest to those who want to be a parent to think twice. This role needs us to be mature in every way. Yes, I agree with you 100% on that. Parenting is not an easy task. It is a huge responsibility. Anyone wanting to be a parent should prepare himself/herself well – emotionally, psychologically, financially. Even the most prepared ones still encounter difficulties along the way. Thank you very much, Sorena, for the lovely feedback. And thank you for sharing your thoughts. I particularly like what you said about keeping oneself on the to-do list 🙂 Wonderful suggestion! As a mom I’m sure most of us can agree that, at some point, we just become less important. My own well-being stopped being my priority because my baby girl is my everything and then some, so my needs just took the backseat and I started neglecting myself. But then I had the epiphany. If I don’t take care of myself, who will take care of my child? Will I be in top condition to look after my house and my family? That’s when I decided that I shouldn’t neglect my wellbeing any longer. Out of all your (wonderful!) advises, the one that stuck the most to me was the suggestion to build a support group, because it’s true. It’s not only people that you can trust with your child, but also people you can vent your frustrations with, and rely on for advice and fun times as mothers. Having similar-minded and equally busy friends truly made a positive difference in my life. We’re really glad we’re able to help you alleviate some of the stress of parenthood. How’s your support group so far? When we become moms and prioritize our child, our selves do take a backseat and we also isolate ourselves from our friends. I’ve also been in such a situation and it’s not healthy for our psychological well-being. The stress could “damage” us in certain ways if we do not have friends to share our frustrations with. from my own experience , watching my wife before and after giving birth to our baby girl . there is not much time and effort to exercise after a long day of taking care of this new little creature. so the new mother who gives 100% of her self will certainly want be able to follow your advises . You’re right – a devoted mom will almost always have no time for herself, however, this is not good for her. We do hope you’re able to convince her to set aside time for herself. She needs it and would surely appreciate that you know what she’s going through. Im a stay at home mom and yes it was challenging. I thought it was easy but it’s not. This tips can help lots of mom’s out there to look good even on their busy schedules at home. When you taking care of the kids while doing household chores sometimes you forgot about yourself. Even you want to sleep you still need to wait until the kids are asleep too because you need to watch them. Yes, indeed. Moms sacrifice a lot for her kids and eventually forgets her own welfare. Taking care of oneself is important because if we “malfunction”, imagine what it will do to our family. It would be like having a plane with no pilot. a difficult birth , the worst thing that she may face is those who blame her and gave her unwanted advises at the wrong timing . the new mom must pick her friends carefully and try to ignore those who make her feel bad about her self even if they were relatives . your baby looks pale is she normal ? A parent will most often encounter another parent who thinks he/she is the authority on parenthood. You don’t need people like them in your lives. No need to argue with them because they will insist on their parenting style. Just remember that only you will know what will work best for your child because you know them better than anyone else so you would be able to deal with them the best way you can. Time management is so important as a mother. Waking up early to fix breakfast, sending husband to work and kids to school, doing laundry and cleaning the house. You had to set the time for each task every day and for yourself, you can be a super mom and a fab woman. It’s really not easy being a mother, the home task they take care of are so much that those who don’t really know what mothers are passing through taking care of their homes would say that full time stay home mothers aren’t doing anything but gossip and sleep. I can remember the day one of my work colleague was narrating his wife’s ordeal with taking care of his home, she always wake up every day by 3am to put things in place for both the kids and husband before they wake up. Correct! Time management is important when setting up your daily routine. It helps ensure you are able to squeeze in the important to-dos of the day. I would say, anything you can do today, do it. From my observations, it’s not only mothers that are stay at home parents. There are good number of fathers who stay at home taking care of their children while the wife goes out to work. Some conditions might be the reason why it’s the wife that is going to work while the husband seats at home to care for the kids. It would be just important for the home dad to find something to do and get his life active apart from taking care of the children. There are several ways to make money online while being at home, so the ones affected can take such measures in getting their life up and running. And thank you for sharing your tips. I totally agree with you about starting the day with a bath. We would feel better and fresh when starting the day that way.